Maybe you remember sledding on that hill in your back or front yard or down the street during your childhood years, or just know that taking an inflatable tube raft down a snowy, steep hill sounds like a thrilling time. 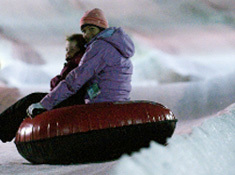 Whatever the case, Snow Tubing is fast becoming a winter activity that most ski resorts and winter fun parks offer. The Snow Tubing in WV at Snowshoe Mountain Resort is just one of numerous mountain activities that guests at the resort can enjoy. Learn more about other mountain fun at Snowshoe Resort WV by clicking around the site. The WV Snowtubing park at Snowshoe WV Resort is at least six stories high, and it has multiple lanes. Guests are only allowed one person per tube; however, tubes can be “hooked” together so that groups can go down the lane together. The WV Snowtubing park at Snowshoe Mountain Resort is located in the Silver Creek area of the resort. Shuttles run to the tubing park at different times and stop at various stops along the way. Check a shuttle schedule should you need transportation from your Snowshoe Lodging rental to the park. You must be at least 36″ tall to go WV Snowtubing at Snowshoe Mountain Resort or at least 4 years old. Guests must wear proper clothing, including footwear other than ski boots. Warm, water-repellent clothing is recommended. When you tube down to the bottom, a Handle Tow lift will whisk you back up to the top safely and with little effort!